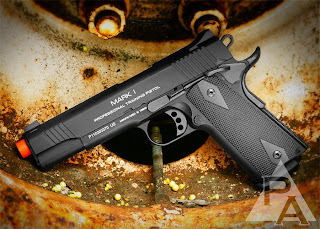 Pyramyd Airsoft Blog: Q&A Day - Used Airsoft Guns: Your Best Friend or Bargain Nightmare? Q&A Day - Used Airsoft Guns: Your Best Friend or Bargain Nightmare? Copyright: Allison Madaras for Pyramyd Air, LTD.
No, I'm not talkin' 'bout Quails & Aarvarks. I'm referring to Questions and Answers. I'm going to open up the opportunity for you (my favorite reader) to ask me questions and then I will either provide you with the correct answer OR I will just make one up. Ideally, you would ask me questions about Airsoft stuff, but if you need advice on other stuff like how NOT to attempt picking up chicks at the local biker bar or how to look good despite being bald, I can certainly look into those things for you as well. 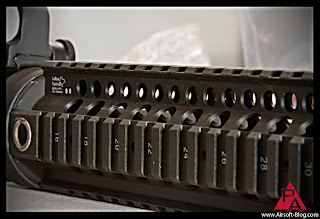 For now, if you have a question, just post a comment on one of my blog articles here on the Pyramyd Airsoft Blog. However, Pyramyd Air will be creating a Facebook page dedicated exclusively for Airsoft soon, so once that's up, you can ask your questions over there as well. I'll let you know when their Airsoft Facebook page is up and online. as a "used item" for my Airsoft M4 AEG. "Hey Tom. What's the scoop on buying used guns & gear? Would you recommend it? Why or why not? Airsoft Answer: Well, first of all, Mortimer, thanks for asking your Airsoft question. Second of all, yes. Buying used Airsoft guns & gear is a great way to get quality stuff that you would not otherwise have been able to afford as easily, if at all. I have personally purchased a large number of used guns being sold on my local forums that were not only in great condition, but were sold to me at a very low price. Retailers have now caught on as well, which only means great things for the bargain hunters out there. For example, check out the pre-owned guns section from Pyramyd Air sometime. As with any pre-owned goods sales or swap meets, it's hit or miss, so you'll have to check in every so often to see what new stuff they have and what they no longer have, but even right now they've got some great stuff hiding in there. Pre-owned, custom Tokyo Marui M16 Designated Marksman Rifle for sale at Pyramyd Air. - M140 Spring. This rifle chronos between 450 and 460 fps with a .20g BB. Normally a gun like this could easily run you upwards of $500 brand new, but check the price on this upgraded designated marksman rifle! That's just Exhibit A for the kind of smokin' hot deals you can come across in the used guns department. Sometimes you can find stuff that's already upgraded, like the Marui rifle above, but others you'll just have stock guns available. That's fine, too. One thing I have had great success with is getting a really good deal on a stock rifle to use as my base platform for a custom Airsoft gun project. 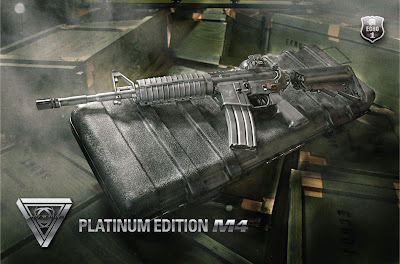 Exhibit B would be the ultra-deluxe Echo1 Platinum M4 AEG that's also currently for sale in the pre-owned guns deparment. I will then buy the upgrade parts separately, which is nice because I like being able to individually select the components that are going into my guns whenever possible. So I can then end up with a custom, upgraded Airsoft rifle and I was able to save some serious coin because I bought a used rifle, which is going to account for the single greatest expense in your project anyway (usually). It makes more sense to me from a cost perspective because I usually end up tearing out the stock internals anyway, so it's harder to justify buying a stock gun at regular price in this case. If you just plan on leaving your gun alone, then I'd go with a brand new one. Don't be afraid to buy used Airsoft guns. However, DO be afraid of the Big, Bad Wolf. He's a mean dude who will ruin your day if you cross him. Random side-note for you to ponder until tomorrow's blog arrives.